Posted in Empower Sales Conversations, Improve New Product Launch, Increase B2B Sales, Presales, Sales, Why LeveragePoint? provide product or solution use and implementation experience in practice. The rewards of deploying presales are significant. A study by a McKinsey team published in the Harvard Business Review found that the payoffs from augmenting presales are a 5% improvement in conversion rates, a 6-13% improvement in revenue, and a 10-20% improvement in the speed of moving prospects through the sales process. Although presales represents up to 30-50% of commercial headcount in some enterprises, presales professionals are usually a scarce and expensive resource. This should come as no surprise. Presales professionals often have advanced degrees. They usually have practical technical knowledge and relevant domain experience. Given these characteristics, finding presales professionals who are also strong communicators and are capable of building customer trust is a recruiting challenge. Great presales professionals are hard to find and come with a high price-tag. Maximizing Presales Impact. The consequence is that sales processes are often designed to economize on the need for presales resources. This creates a resource management problem for sales reps moving opportunities through the funnel. It often puts sales reps in a position of competing to get the best presales professionals involved in their deals. Presales professionals face a number of challenges as well, but their own scarcity is the big one. In most organizations, presales is stretched too thin. Their schedule becomes a limiting factor in setting up the right meeting. They are often constrained in their ability to follow up with accounts fast. Presales scarcity often slows down the overall sales process. Let’s look at this problem by stepping back to look at the buying process and the selling process. The Buying Process and Good Sales Reps. Early in any new account sales process, a sales rep is looking for someone in the account who is interested and willing to engage with the rep in a conversation relating to our offering. But just because someone with a reasonable business card engages and appears to evaluate our product doesn’t mean the rep is making progress toward closing a sale. Spending time with curious window shoppers seemingly evaluating our offering is a fast route to the sales unemployment line. For sales reps, their own time is also a scarce resource. Qualifying prospects is critical to sales effectiveness. Good sales reps understand that enterprise buying is a complex, consensus-building process that is rarely transparent and is usually mysterious. Good reps realize the need to identify account contacts who can and will steer the account to a decision to buy. Buying became a team sport long before selling became one. Sales-presales teamwork is crucial to catching up with buyers’ own processes. But it is sales’ job early in the process to understand the x’s and o’s on the buying side of the field. Qualifying an account AND qualifying contacts within the account are critical. 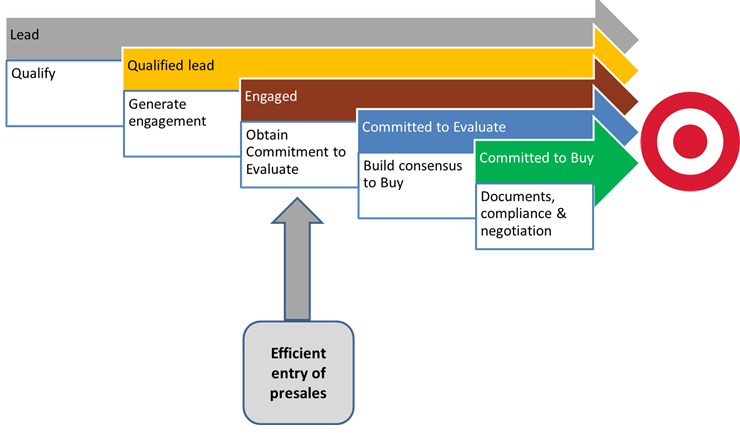 The Sales Process and the Entry of Presales. Presales professionals are invariably brought into a sales process partway through it, but their point of entry is an important variable. Looking at a typical process, for any new lead, a sales rep starts by qualifying the lead. Generating account engagement is often hard work and is a necessary step before the aim can be to obtain a commitment to evaluate our product. 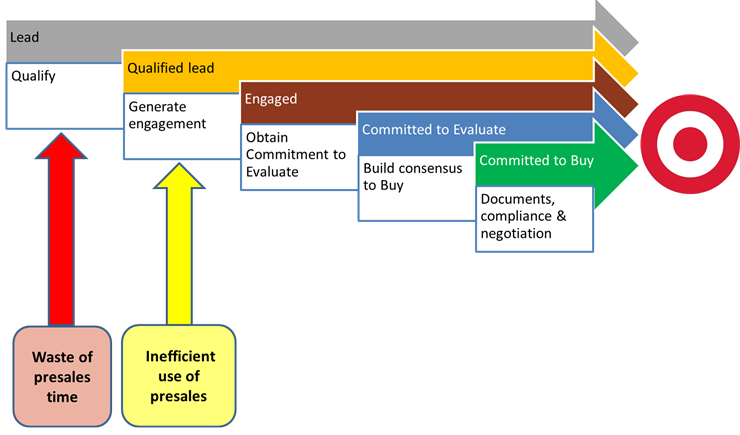 Building consensus to buy then becomes the central sales team objective through the evaluation phase as buyers evaluate and a solution is configured and refined. All of this is usually necessary before that sometimes-faint, light-at-the-end-of-the-tunnel appears when the buying team is committed to buy and willing to move documents, compliance and negotiation through their own process. Presales’ heavy lifting is usually greatest later in the sales process during the evaluation phase. Presales sometimes takes on a quarterback role in building customer consensus. 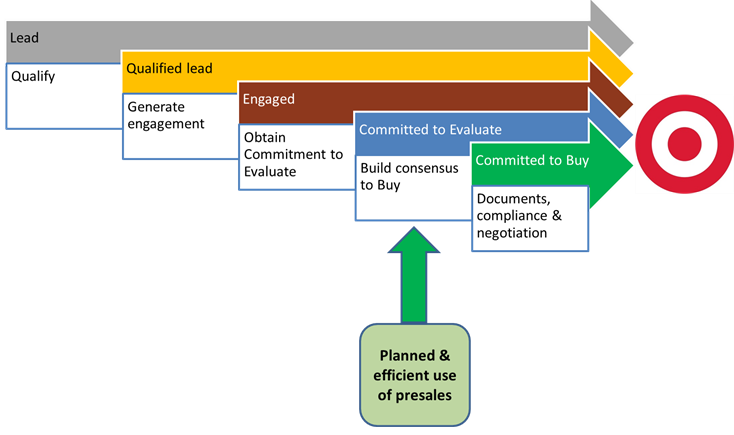 Presales professionals engage with different stakeholders to answer technical questions and handle objections. They orchestrate PoC/proof of concept projects and/or detailed demonstrations. They often do extensive discovery to choose or configure a solution that fits account specifics. They provide use and implementation experience from other customer situations, building confidence among customer stakeholders that our product will deliver. The best presales professionals refine and customize their Value Proposition by building customer consensus on a quantitative, economic business case to buy. This customer consensus becomes both a basis to obtain account agreement to buy and a great way to accelerate documentation, compliance and negotiation processes. But the evaluation stage is a fairly late entry point for presales professionals, especially if presales is quarterbacking the customer evaluation process. When presales is orchestrating a PoC, managing customer expectations for the PoC itself is critical. Building customer consensus on well-defined goals of any evaluation process is the best way to convert the opportunity into a decision to buy. Experienced presales professionals have wasted enough of their own time configuring complex solutions or being stuck in delayed, unproductive PoCs that they have learned to do their own, presales-specific, account qualification before committing themselves to the heavy lifting of evaluation and configuration. Presales qualification, assessing whether it makes sense to move an account forward into an evaluation process, should be recognized as a way to get the most out of scarce presales resources. The design of the sales process is often that presales professionals aim to join the sales team at the point where the customer is engaged and the primary objective is to get a customer commitment to evaluate. A quantified Value Proposition for our product, even if it is based on benchmark data and other customer situations or case studies is a useful tool in these conversations. It becomes a fast way for presales entering the conversation to establish credibility with account stakeholders. It helps presales demonstrate an understanding of the customer’s business. It supports presales professionals as they aim to take on a role as trusted advisor to the customer. A Value Proposition also becomes a foundation for presales to engage in their own customer discovery, understanding the customer’s business and problems. A Value Proposition becomes a basis for presales to test which points of our solution’s differentiation resonate with customer teams and with individual stakeholders. It becomes a means to identify and agree on an endpoint or deliverable (sometimes quantitative but often qualitative) to a PoC. Value Propositions are a great qualifying tool not just for sales reps but also for presales professionals as they enter the process. Wasting Presales Time. No matter how well designed a sales process, presales professionals are often introduced into an account earlier in the sales cycle. The sales rep who has been struggling to get any meeting with an account will sign presales up for a call in the hope that presales will be able to get account engagement where the sales rep was unable to do so. Doing this too often with a busy presales professional is a sure way for the rep to lose internal credibility. Presales professionals stretched too thin want to spend their time where it will generate revenue. Introducing presales too early can occur with qualified opportunities where the rep may still be learning the product or trying to figure out their own basis for account conversations about the product. At least in this situation, having presales on the call becomes an opportunity for a smart rep to learn the product and add a few tools to his or her own toolkit for the next call. For patient, team-playing, presales professionals, these situations are at least partly productive. They are a normal part of launching a new product, testing/refining messages and making those messages viral with in the sales force. For a new rep, they may be an expected part of on-boarding. At worst, these situations are misdemeanors in the eyes of presales. Felonies occur when sales reps involve presales in unqualified accounts. There is no more frustrating waste of time for presales than to spend cycles preparing for a call or to spend time on the road to meet a window shopper. Presales learns rapidly to identify the reps who cry wolf for unqualified target conversations. Avoid Wasting Presales Time. The use of Value Propositions by sales reps improves productivity of the broader sales team. Value Propositions are a way for sales reps to prepare for early sales calls, highlighting key messages and points of differentiation. Value Propositions are a great way for sales to identify a product opportunity that fits an account. Having representative bottom line numbers that will resonate with customer executives is a means to get engagement and to set up the right meeting. Testing headline economic impact numbers and quantified value on an individual is a good way to qualify the individual as well as the account. Shared Value Propositions between sales and presales become a natural way to introduce presales into the account. Sales learnings from the account using Value Propositions are a better starting point for presales discovery and engagement. Presales values a focused basis for asking sales about previous conversations; a Value Proposition becomes a very specific way for presales to organize sales rep questions that are central to presales call prep. The answers to those questions give presales a better way to gauge whether the account and the target individuals within the account have been qualified by sales. Presales can use unanswered questions about previous Value Proposition conversations as a way to get sales to do more homework before presales commits to get involved. Sales is a Team Sport. That said, presales professionals sometimes take the position that they should own a customer’s Value Proposition and that sales should stay away from value discussions until presales has arrived at the scene. Presales understands the customer’s business better. They understand how our product will deliver value to the customer better. And they are often gun-shy about sales putting any numbers in front of an account before they can understand customer specifics and scope out customer configurations. Although this approach to presales turf may recognize current skill sets and experience, it is a perverse intermediate term strategy. Presales time is scarce. Holding a Value Proposition back in a sales cycle will result in presales spending more time on unqualified opportunities, on unengaged accounts and in the wrong meeting at the wrong time. Some writers see a future where there is no role for a generalist sales rep whose primary job is to focus on account acquisition, account retention and account upselling. These writers fail to recognize the skill sets a good rep brings to the table. They haven’t appreciated the degree of difficulty in replicating presales knowledge across a larger presales force. They haven’t understood the waste of scarce time required by asking presales to take on roles held today by sales reps early and late in the sales cycle. They haven’t done the math on the cost and risk of replacing a sales team with a group of mythical, solo, omniscient, presales account managers who have no access to leverage from sales reps. Shared Value Propositions are a better answer. Recruiting renaissance presales reps in an increasingly complex world is a strategy destined to fail. Shared Value Propositions help sales teams with different talents and experiences address sales challenges at many points of the B2B sales cycle. Ultimately those Value Propositions can be shared with and owned by the customer too. A consensus Value Proposition is a useful tool, not just for sales teams, but in the hands of customer sponsors through their own approval process, as they make a compelling internal business case for buying our solution at a fair price. That becomes a strong basis for winning sales teams to collaborate with their customers.